I found this and several other variable checkerspots (Euphydryas chalcedona) flittering about and feeding on golden yarrow along the Garapito Trail, on a recent run in the Santa Monica Mountains. A closer look revealed an outlandish creature with black-spotted orange ladybug eyes, a bright orange spiked hairstyle, and a substantial spiraled trunk. 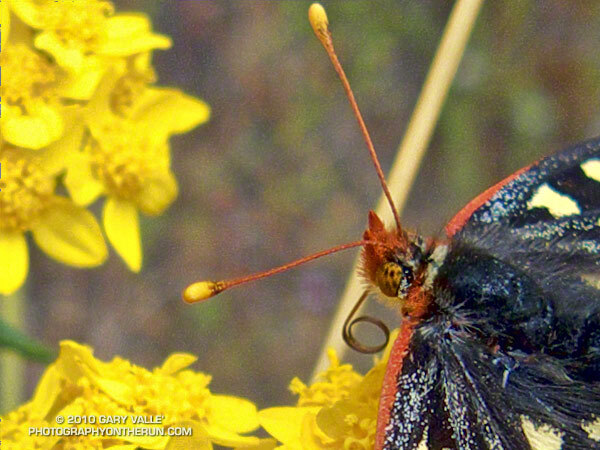 The “hair spikes” are part of the butterfly’s sophisticated scent sensing system. They are probably used in combination with the antennae to provide a three dimensional olfactory picture of the butterfly’s surroundings. This would help guide the butterfly to food or potential mates. Butterflies are masters of low speed flight, and exploit several unusual mechanisms to generate aerodynamic lift. They are also opportunistic, and will take advantage of thermals and variations in the windfield to move from one place to another. 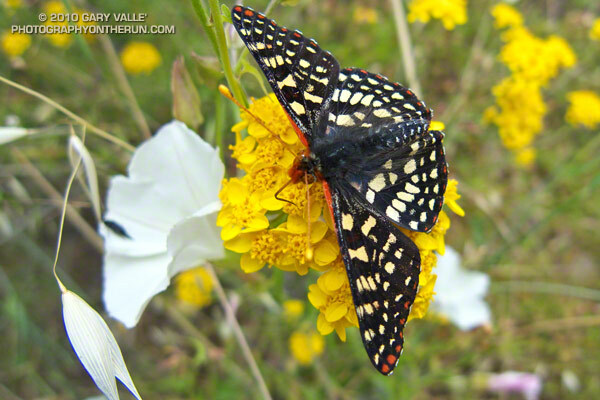 Several times when I’ve encountered a butterfly on a run, it has flown along with me for a surprising distance. I know that butterflies can be attracted by color, that’s happened in my bright yellow kayak. But in this case I don’t think it’s color or coincidence. It seems to me the butterfly is surfing the wave of air pushed around me as I run, similar to the way a porpoise surfs the bow wave of boat.